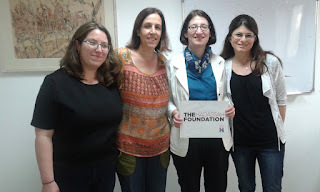 Foundation grantee Women's Spirit has a unique mission when it comes to female victims of domestic violence in Israel. While other nonprofits and government agencies provide these women with social services and counseling, the staff (pictured above) and the many volunteers who power Women's Spirit help them get on their feet financially. The Tel Aviv group now also works with women at a shelter in Haifa, and is working with banks to ensure that women who are in debt due to their ex-husbands' activities will be treated in a more understanding manner.